On Friday, Nebraska got a commitment from 2019 4-star running back Ronald Thompkins‍ from Grayson High School in Loganville, Georgia. Thompkins (5-11, 195) was recruited by many big-time schools from all over the country with offers from USC, Tennessee, LSU, Penn State and Alabama. At one point, he was part of the 2019 Florida State recruiting class. At another point, after leaving the FSU class, he put out a top five that did not include Nebraska. So how did his recruitment get shut down with a commitment to Nebraska? I spoke with Grayson’s recruiting coordinator, Kenyatta Watson Sr., about Thompkins and how his commitment unfolded. First, I wanted to know what type of player Nebraska is getting. When Watson says that it’s saying a lot to name Thompkins their best football player, that’s the truth. In case you aren’t aware, Grayson has 14 guys in the 2019 class committed to Power 5 schools. Among those players is Watson’s son, Kenyatta Watson, a 4-star cornerback committed to Texas. Also, in that group is 5-star linebacker and Auburn commit Owen Pappoe, who Nebraska recruited very hard. Now that we know Thompkins is versatile, that should make him a great fit in Frost’s offense, right? Watson certainly thinks so. As the recruiting coordinator down at Grayson, Watson interacts with a lot of college coaches since the school consistently has so many Power 5 level players. He also has the unique vantage point of having a highly recruited son that Nebraska did offer. So what are his impressions of the new staff in Lincoln? “I’ve had a really good relationship with them," he said. "I’ve known Coach Frost since he was at Oregon. Coach Beckton and those guys I’ve known them since before they got to Nebraska. They did an exceptional job recruiting Ronald. Even when he put out his top five, it didn’t matter. Coach Held kept checking in on him and kept recruiting him. I think that’s what ultimately did it in the end. They are a bunch of great high-character guys. They do things the right way and will be extremely successful at Nebraska. "It hasn’t changed from stop to stop with any of these guys. I’ll never forget that Coach Beckton was recruiting one of our tight ends going into his senior year. There were eight-graders practicing off to the side and he was like 'who is that?' I told him those were our eight graders and he went over and watched them. He came back and told me that he has never in his life seen kids this big and physical moving that well at that age. So, he constantly kept in touch about the kids. All of that stuff worked in [Nebraska’s] favor in getting this commitment from Ronald." As mentioned above, Watson’s son was offered originally under the previous staff. The family was intrigued enough by Nebraska at that point to take a visit to Lincoln. Needless to say, they were very impressed with what they found in Lincoln. “My son and I went to Nebraska two years ago and this is on the record that Nebraska was our best visit to this day," Watson said. 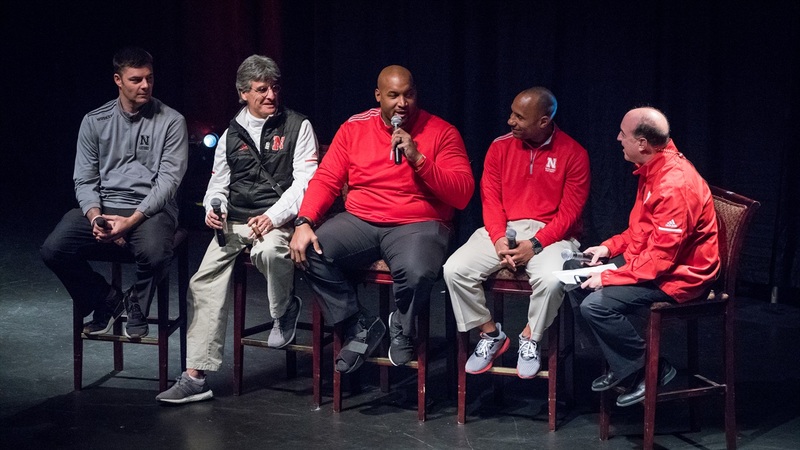 "We were pleasantly surprised with everything they had to offer, the community, the fan base, everything that was Nebraska. So, we have two kids out there now, Mohamed Barry and Breon Dixon, that are very close with Ronald. Coach Frost asked if we had a chance with him, I told him that things are so fluid you never know. His response was 'we are going to recruit him until he tells us no.'" Things started to change with Thompkins about a week ago, according to Watson, but the Huskers still had to beat out some of the top schools in the country. "Alabama was the other school recruiting him the hardest. They loved him. They loved his versatility and what he could do in their offense," Watson said. "TJ Yeldon is who he reminded Bama of. I told them today that he was committing to Nebraska and they were like 'damn, we really liked him.'" If you think Nebraska just came out of left field to win this recruitment, Watkins says they certainly did not. He credits their genuine approach with being the ultimate difference maker in landing the 4-star running back. Watkins tells me that Thompkins is at home with Nebraska and his recruitment is done. Thompkins is hoping to visit Nebraska next week for the Friday Night Lights camp on June 22.